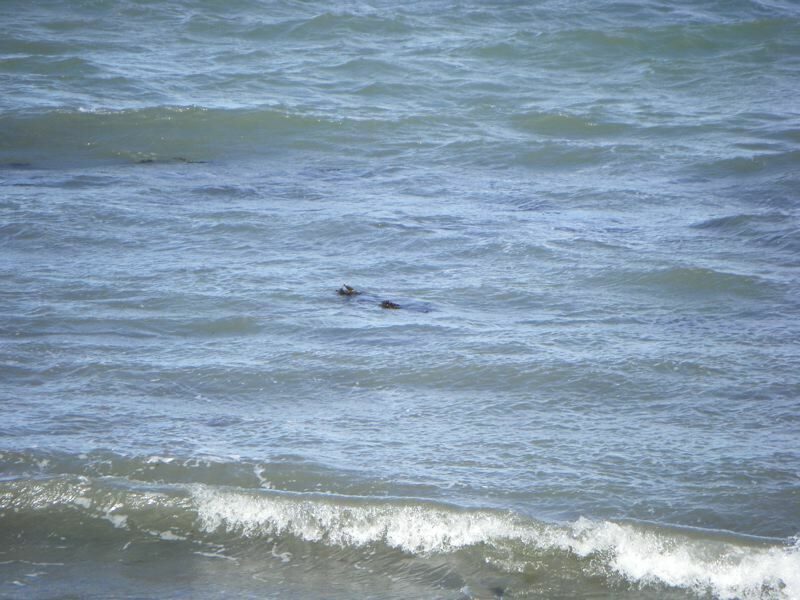 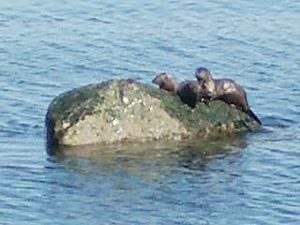 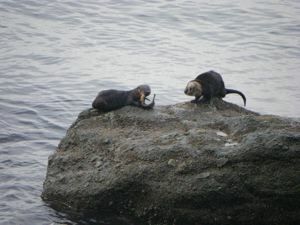 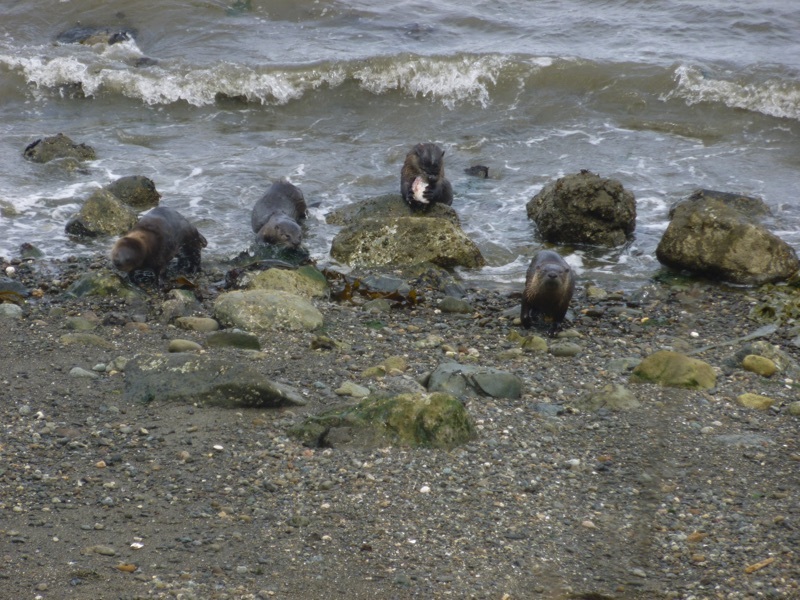 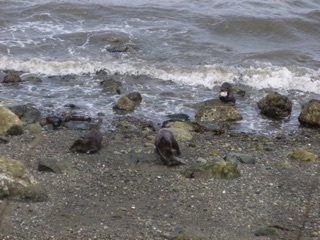 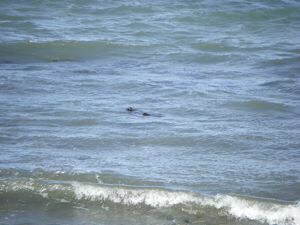 We first spotted these river otters while they were swimming in the Strait of San Juan de Fuca. We were a bit east of town, past the Rayonnier site, along the waterfront. 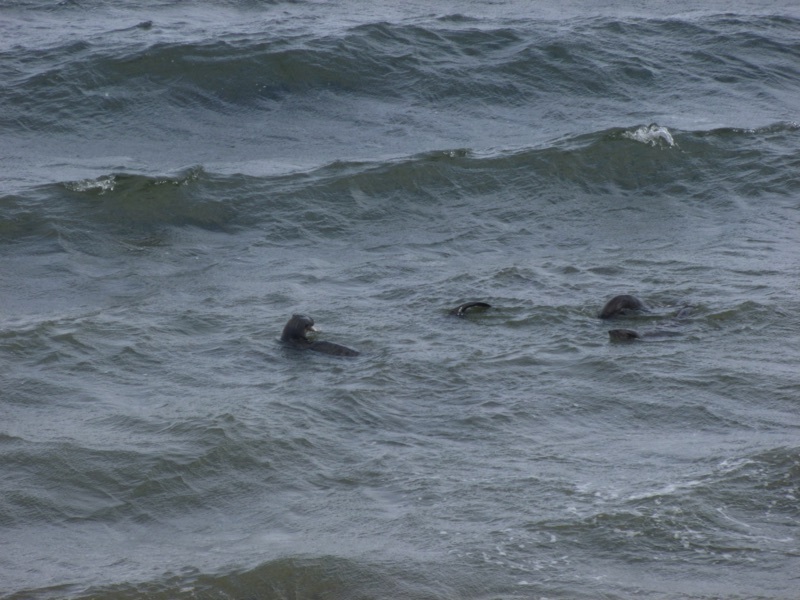 One of them had a fish of some sort. 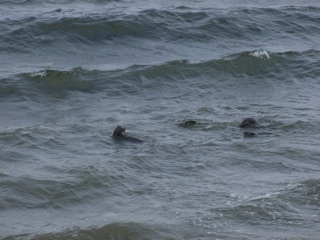 They made their way to shore where they posed for a bit. 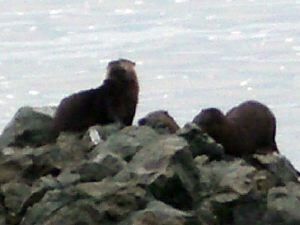 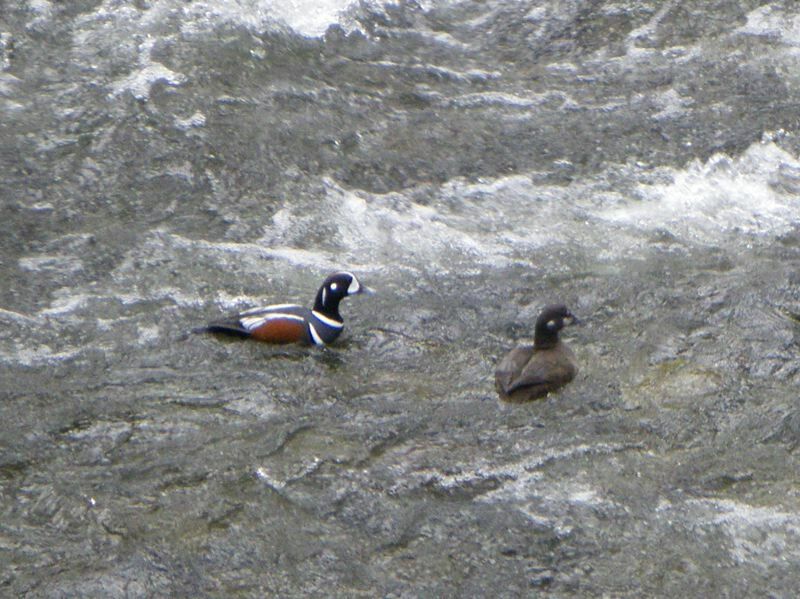 Then they disappeared into the rocks below us. 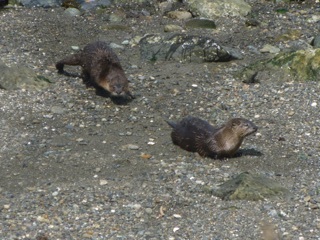 Click on the pictures to see just how cute they are. 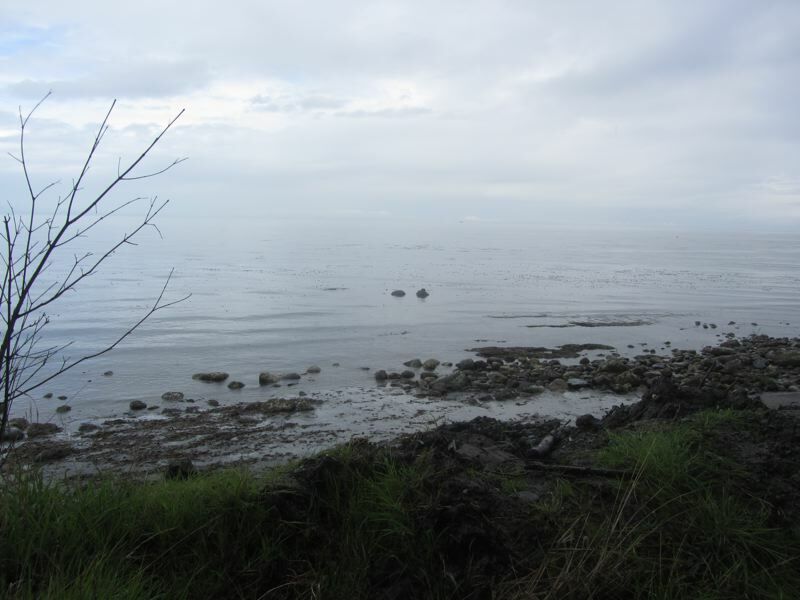 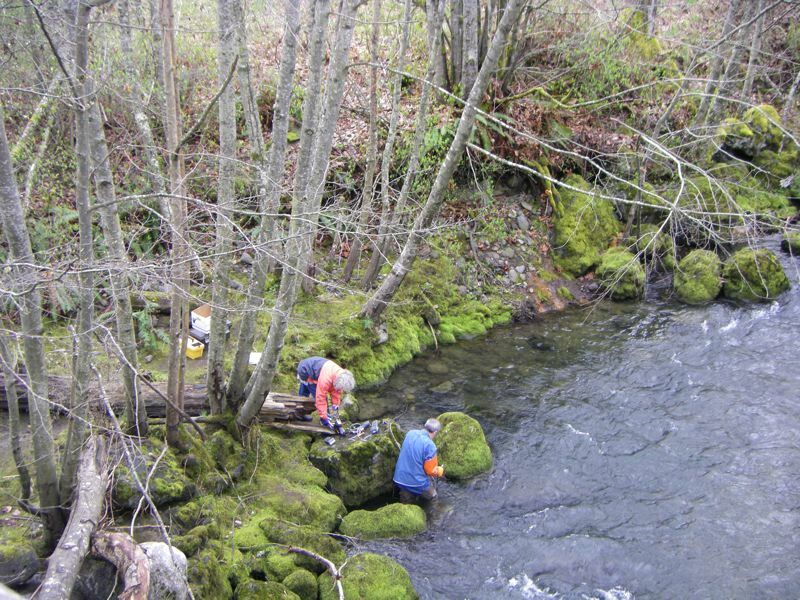 We were down at Morse Creek, walking west along the Discover Trail towards Port Angeles. 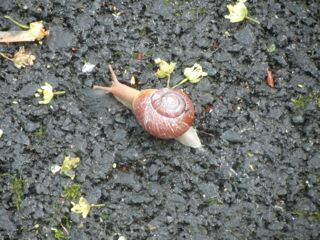 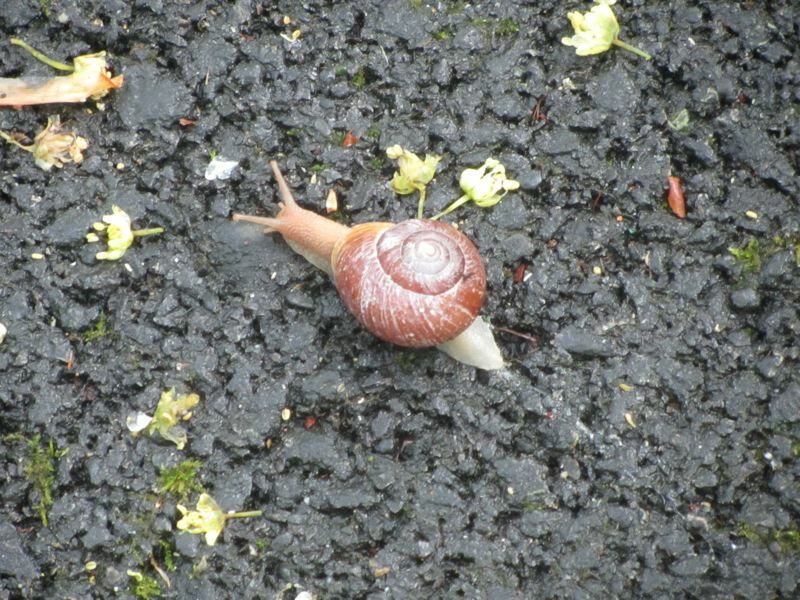 It is mid-January, so it is surely still winter, but we also found our first signs of spring. 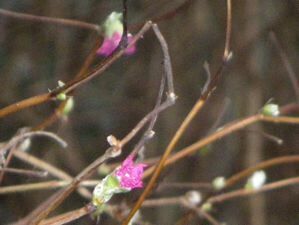 Check out the salmonberry flowers! This was just one bush in a sheltered area by a stream at the base of the bluff, but the flowers were out. 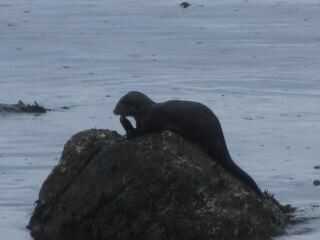 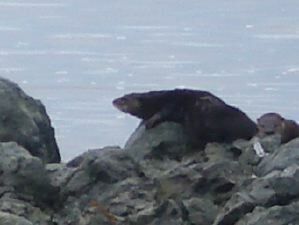 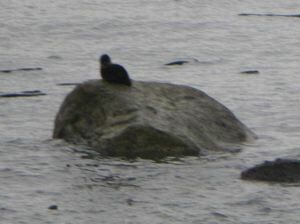 There was a river otter on one of the rocks. 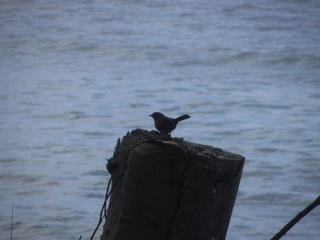 This isn't a very good photo. 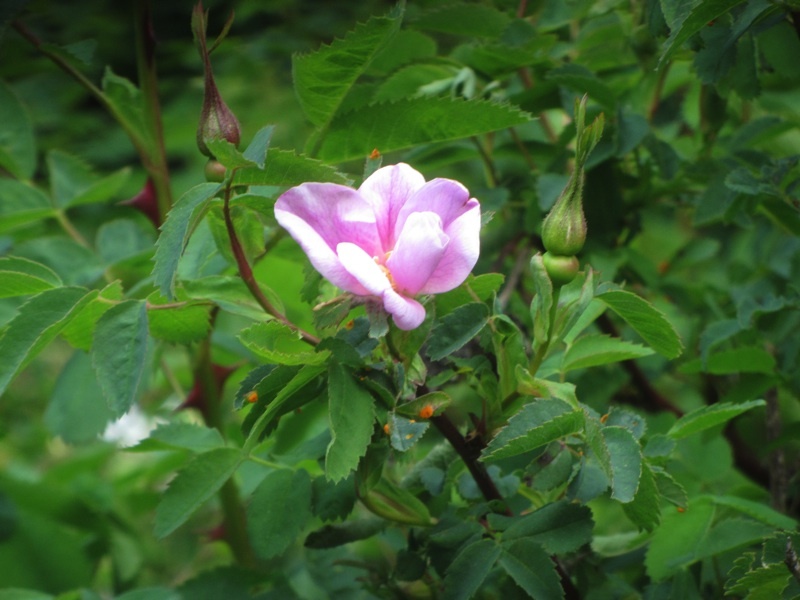 We are still learning what we can and can't do with our new camera. 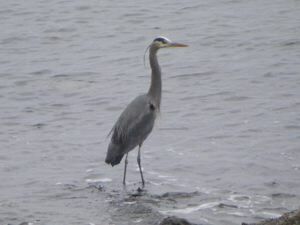 Our picture of a great blue heron came out better. 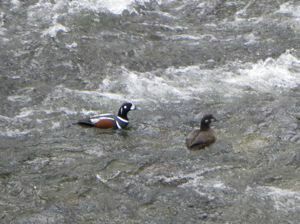 We don't see as many of them as we used to back in the Boston area, but they like the mouth of the Lee's Creek, maybe because of the fresh water. 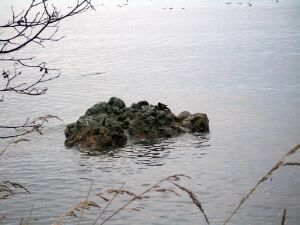 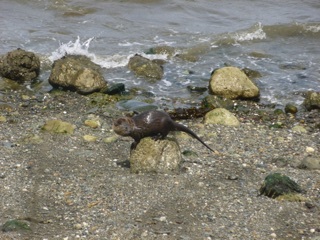 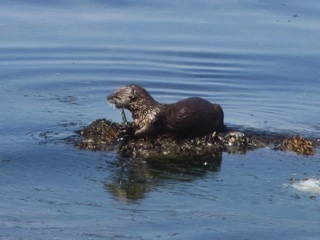 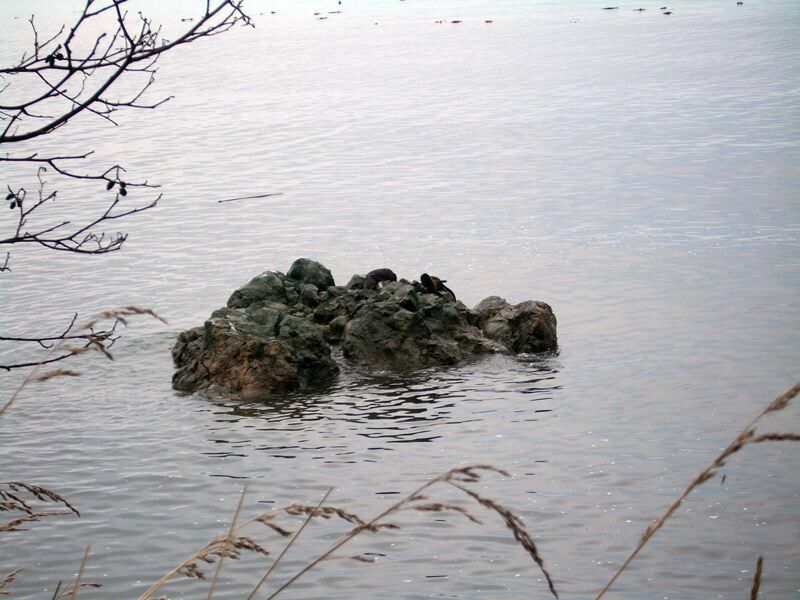 We often see river otters on the rocks or swimming around off the Olympic Discovery Trail that runs from downtown Port Angeles to Morse Creek. There's a little creek that runs down from the top of the bluff a bit west of the storm bypass, and we've seen the otters crossing the trail from that area down to the water. 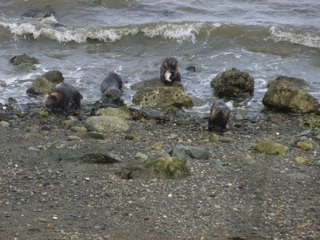 This time we had our camera with us, so we have proof.